In the second episode of The Walking Dead’s fourth season, Andrew Lincoln’s central character is asked why he’s no longer wearing his hat. When he was the tortured former sheriff trying to eke out an existence after the zombie apocalypse, that hat marked Lincoln as the leader of the show’s core cast, the cowboy hero riding to the rescue. But following the events of season three, Lincoln’s hung up his hat and gun. He’s taken up farming. Maybe he should start wearing overalls, someone else suggests. 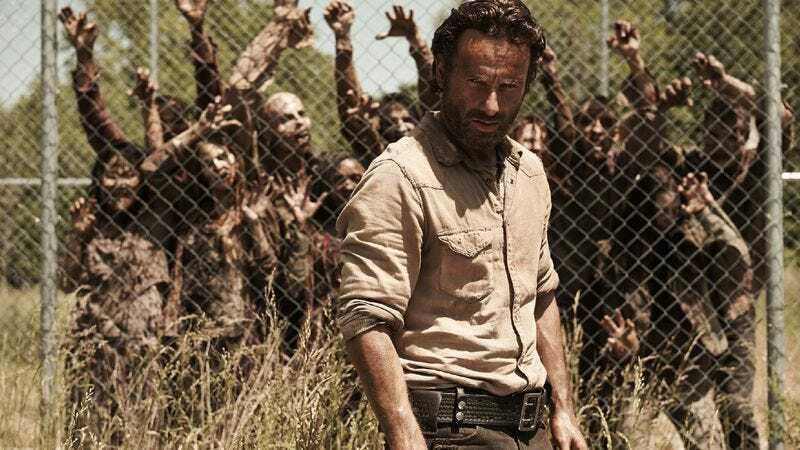 It’s a telling examination of why The Walking Dead has never entered the ranks of genuinely great TV series: The show is interested in its characters less as fictional human beings and more as iconography. They’ve become a collection of tropes and costume pieces, like characters that have stepped out of a fourth-grade theatrical production of Night Of The Living Dead. Some of this has to do with the series’ source material, which is spare, visual, and largely interested in its characters as people who suffer. But it also has to do with how the series doesn’t know how to tell compelling human narratives in the face of Armageddon. It shuffles just ahead of the forces of narrative disintegration, but it will lose that race sooner or later. Judging from the first two episodes of season four, this is another stretch of The Walking Dead that begins with several promising avenues that will inevitably fall to the series’ need to feed the zombie horde. New showrunner Scott M. Gimple has delivered a season premiere whose title indicates the series’ status quo as this season begins: “30 Days Without An Accident.” The prison that Lincoln and company turned into a safe zone in season three still faces the need for daily walker dispatch—throngs of reanimated corpses continue pressing against the fences. But it’s turned into a nice place to be, with hard-won vestiges of civilization like agriculture and electricity. It’s also filling up with new folks, as the series tries yet another TV paradigm to toss into the middle of a show about zombies: the small-town drama. It’s not quite Everwood with zombies, but between the friendly folks who’ve coupled up and the troubled father-son relationship at the show’s center, it’s close. 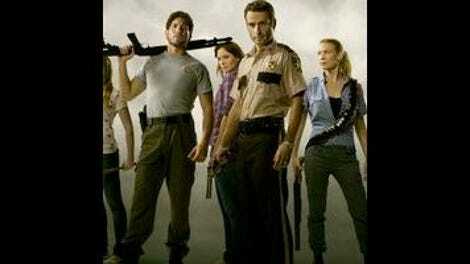 This remains a show about the zombie apocalypse, however, and the stable status quo doesn’t remain for long. Gimple was the writer of season-three standout “Clear,” which was essentially a stand-alone episode in the season’s larger story arc, offering an opportunity for Lincoln to catch up with Lennie James’ hollowed-out survivor and compare battle scars. It’s interesting to see that episode’s notions about civilization—and its retreat in the face of never-ending battle—repeatedly reflected in the first two episodes of season four. Lincoln and the other prison dwellers give up bits and pieces of their peace of mind, and the show is able to make these moments count. Lincoln, in particular, has rarely been better on the show than he is in the closing moments of the second episode. Yet The Walking Dead is hard to completely write off, particularly for fans of the genre. The series creates an atmosphere of intense dread at the drop of a hat, and in some ways, it works better as a mood piece than anything else. Similarly, Steven Yeun and Lauren Cohan’s portrait of a new marriage trying to take root during the end times is surprisingly tender, while Scott Wilson quietly continues to give a thanklessly great performance among the ruins. Kerry Condon drops in as a mysterious new character and delivers her usual excellence. And despite the show’s irritating insistence about giving its regulars love interests solely for the purposes of suspense, Norman Reedus and Melissa McBride strike a relaxed flirtation. The Walking Dead has all of the pieces to be a great TV show. Even Lincoln—once the show’s weakest link—has risen to the occasion. But for Gimple to take the show from “mediocre-to-good time-waster” to great TV will require deepening the stories and refreshing the conflicts that don’t involve zombie stomping. Above all, he must remember that the truly great series feature living, breathing characters, not collections of props that somehow take human form.